I remember the last weekend at the end of doolie year when I had a weekend pass left but no money to go anywhere so I didn't sign out on Saturday. I woke early Sunday and decided I didn't want to go to chapel, so I signed out on my weekend pass. You guessed it! They decided that I could have gone to Saturday evening Catholic Chapel and therefore I got written up for missing mandatory chapel. Served my tours and if you remember, mandatory chapel was declared unconstitutional that summer. So, the guy that is now the Head Deacon at his church was the last ‘75er smack to get written up for missing mandatory chapel. I had a Gibson SG electric guitar under the bed in my room. One day I went to play it and noticed when I pulled the case out from under the bed, that it was very light. You guessed it . . . empty. My assumption was that someone had borrowed it and would soon return it. As I recall, the next day I left for an extended road trip with the Hockey team and basically forgot all about it for a couple of weeks. After checking once more (case still empty) it dawned on me that my guitar had probably been stolen (naiveté is bliss . . . ). I went through the process of reporting it, in an attempt to recover it (when did I first discovered it missing?, all right inspections? etc). 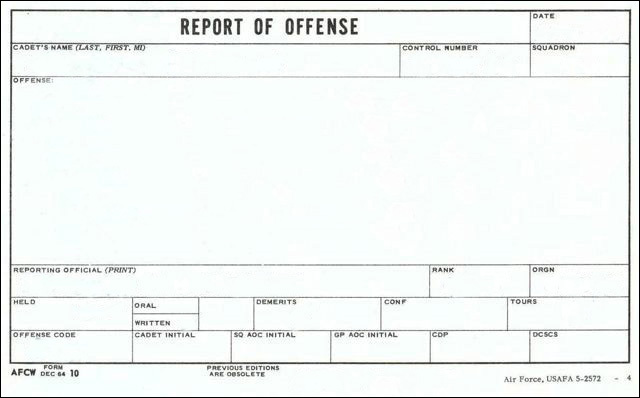 The next thing I know, my AOC (Capt Ball) sends a Form 10 my way for something like "tardy reporting of a stolen item." My guitar gets ripped off – and I get demerits…that's just so wrong! It may not have been the most unusual, but when I was Deputy 1st Group Commander, I wrote myself up for having a car as a 3rd classman (a 1963 VW Bug owned with John Janson from CS-05). I was being "blackmailed" by one of the squadron commanders, so I decided to clear it up that way. It all got handled behind closed doors, with BG Vandenberg saying what was in the long past will stay there . . . Speaking of that "illegal" car, I had inadvertently left the gas cap off (in the trunk) one night when filling up in a snowstorm. I parked it under the dorm Saturday night. John and I couldn’t get it started the next day because water was in the gas tank and the temp was very low. We ended up pushing it down to the lower cadet parking lot and we sweated it out for 3 weeks until the temperature got high enough for us to get it started. Do I have any memorable writeups? OK, I'm pretty confident of at least earning a spot on the podium for my answers to this one. 1. By one of the professors for riding an elevator in Fairchild Hall; it was really late one night, I had to go all the way from bottom to top and thought I could get away w/ it; dumb, really dumb. He asked me if I had permission to be on there and I said.......no. WRONG ANSWER!!! 2. By one of our vainglorious classmates whilst walking across the terrazzo on what had been, just prior to this incident, an absolutely beautiful day, for having the sleeves on my flight-suit rolled one turn up my forearms, Robin-Olds style. Everyone did this, but by this time, it seemed that I had a big target on my back and was attracting a lot of these things, leading to my next Form-10. 3. By a Second Class member of the Wing staff for putting my blue jacket around my girlfriend’s shoulders while sitting in the lounge in Arnold Hall (she was either cold or trying to prevent those horny boys that hang out in A-Hall from staring at her boobies). This was during our senior year, mind you, and the only reason I was there was that I was serving hard time for #2 above and restricted to the base. This guy didn't even have the balls to confront me about this offense at the time but rather sent me the Form-10 through the distribution system. I went over to the Wing staff area, waited in his room (with his very nervous roommate) for him to return from class and convince him, under threat or serious bodily harm to retract it, but it was very obvious to me then that, sadly, I was carrion for the vultures there (and there were some vultures there). 4. What I recall as my most absurd: [Classmate name withheld] actually wrote me up on a Form 10 for speeding on Academy Blvd. because I passed him in my car coming back to base one night. I couldn't believe it! I went up to his 4th Group staff office/room and inquired if he had a radar gun in his car, had been deputized by the local sheriff, or what? He offered to rescind it only if I agreed that he had the authority to write up such an infraction, even if I was not guilty of any such transgression. Not being much of an expert on the Regs, I didn't really know for sure, although it seemed odd to me that one could get written up off-base. I mean, jeez, that was half the reason to get off-base in the first place—to escape the authority and effect of [classmate name withheld] and his ilk. I took the deal; I couldn't really afford any more trouble at the time, besides I figured he was just jealous because I had a pretty girlfriend I was coming back from seeing (see #3 above) and a semi-hot car at the time—neither one of which I was able to keep. But more to the point, neither one of which I believe [classmate name withheld] has ever been good or lucky enough to even have in the first place (BTW, although the car can be of any vintage, the girls have to be of legal age to qualify in this regard). I got my first and only Form 10, with demerits and tours, my senior year. As near as I can figure, I got it because I hadn't gotten any in the previous three years, and they didn't want anyone graduating from the Academy without getting a demerit (didn't Robert E. Lee manage that at West Point?). I marched about 4 tours one afternoon. Duke Buhyoff from my squadron was written up for "Hair looks like wood." He packed it with Vaseline and a watch cap and since he was a white guy from Upstate New York . . . he kind of looked like a Ken Doll. Went to a hockey game senior year, with a date – a rarity. I wore non-issue glasses (not the attractive, black, AF-issue, birth control glasses). A couple of days later, I received a Form 10 for being out of uniform. Sent by the d____less [classmate name withheld]. He didn't have the balls to confront me personally, just sent it through the mail along with a few tours. When we broke into the Commandants Office, during our 3-degree caper, we found a Form 10 made out to “Ace” for “Breaking into the Commandant’s office” which I still find a little creepy. The award for dumb-smack-of-the-day goes to Mark D. Holmes, of Horny 18, the red-headed football manager, who was reading a book and sunbathing on the Chapel hill one nice Spring day. He returned to CS-23, took a nap, and when he awakened, was blind! The reflection of the sun off the book at 7000'-plus burned his retinas, and he was blind for a couple days. His other senses did take over – and we naturally had to pick on him! Now, did he get written up for that? Hmmmmm, I think so! Why not! I talked Rick Townsend into a fridge so we could have ice cream readily available (I am an addict) late night. We concealed it on a stand by putting issue socks on the legs and putting the legs into our boots in the closet. We drapped our uniform arms across the front so that the whole fridge was well hidden...or so we were convinced! I was returning from class one day and saw a commotion down the hall in my alcove...I made a detour but returned to my room later only to find that we had been busted during a random inspection when they tried to pull out a boot to check the shine and heard the jiggling of the fridge! And that was BEFORE Haagen Daz! Six times. I was a CDB Ace before the end of our Junior year; I'm not particularly proud of this, but when you get your first one in the Fall semester of doolie year, it's not that hard, really. I don't even remember what they were all for. Third Degree Xmas: for a girlfriend's unopened, “surprise” Bacardi mini-bottle gift, in the dorm. Confirmed "non-drinker" Rick Douglas served 6 months and 120 tours (+3 added for uniform irregularities in a raging snowstorm ). Subsequently permanently demoted from rank/position (Guidon Bearer) and earned perpetual disdain from AOC Capt Welty (who bore a striking, Rogaine-free resemblance to "Colonel Klink"). After having served all punishments to the letter, the CDB was completely reversed and dismissed. I asked if I could save all the punishments served to apply towards any future indiscretions and was told, curtly, "NO!" For owning and maintaining brother's car after he graduated. "The Loose Hog 5” during our doolie year. 4 of them bet the 5th ($20 each) in Arnold Hall that he wouldn’t feel up a well endowed female sitting with friends at another table. He collected on the bet – but the gal turned out to be the Sergeant Major’s daughter. I managed to be the guest of honor at two CDBs. I had 2 CDBs . . . for the first, I got 6 months restrictions but something less than 120 tours. I think it was only 80. For the second, I got 3 months restrictions and a couple dozen tours. One CDB for me – having a TV in Summer T-41. I am ashamed I was such a bad American. Our classmate (name withheld) ran the CDB and threw the book at me – now THERE was a good American, and I appreciate the guidance he gave me to put me back on the path to Air Force officership. Steve Nichols and Gary Barrentine – all Horny 18ers, their Senior year for playing poker after-hours on a school night . . . Board chaired by Rick Layman with whom I became good friends afterwards in Strategic Air Command. Got 1 CDB for – get this – the Communist act of attending a DIVING meet to watch Rick McAlister in CIVILIAN clothes—after they chastised us for not attending enough Academy Sports activities – can you believe it? I was #1 at Rebeleven for tours and confinements. Can't remember exactly, but was WELL OVER 6 and 120. Two CDB's, Honor and Ethics Boards – cleared in both. What a legacy. I call this story, "That was then, this is now, 1975 style”. Back then, in 1971/72, seniors had fridges in their closets and went to breakfast in just their A-jackets. Life was clearly great as a senior. I could hardly wait. In 1974, now a senior at my first noon meal formation of the academic year, I had just had my uniform inspected, as a senior, JUST LIKE I WAS A SMACK. Some dirt on my pants earned me a form 10. Group Staff then inspected my room and my bed WAS NOT TIGHT ENOUGH which earned me restriction to the cadet area for the weekend. Things just proceeded downhill from that point that day. At academic call to quarters, I was at Arnold Hall with a girlfriend who volunteered to drive me to the dorm in 1st Squadron. When I got out of the car and came up to the sixth floor, I was met by a Wing staffer asking me what I was doing out of limits during academic call to quarters. A ‘74 grad in our squadron had revised the regs the previous year which re-drew the cadet limits to the outside of that dorm road so you COULD get a ride back to the dorm. At my CDB, the ‘74 grad had submitted a letter to that effect. The Board deliberated for almost an hour while I waited outside the room. The verdict? While it was unclear to them (??) as to the actual cadet limits, it clearly stated that one was not allowed in a parking lot during call to quarters. Since I had to walk through those parking slots in front of Arnold Hall to get to my girlfriend's car, I was in a "parking lot" and therefore nailed. I don't remember the number of tours, but my restrictions to the cadet grounds lasted until Christmas Break. My senior year was certainly not what I imagined it back in 1971/72. CDB 2nd class summer – Demon Alcohol! Shot off bottle rockets – got caught. During ‘75’s senior year, there were so many Firsties on Conduct Pro (over 170) that the Wing ran out of unranked shoulder boards! Anybody get two on consecutive days? Not write-ups – actual CDBs. That was me about a week and a half into our 2° year. In March 1975, after 500 plus demerits, a CDB, and walking over 100 tours in the previous few months, I faced Colonel Bailey and several other officer “henchmen” in a boardroom on the top floor of the Library. It was a “wakeup” call. “The Loose Hog 5” – (names withheld pending advice of counsel). I know I had over 100. I don't know the full count. 2nd Semester, Firstie year – alone. 300+ Perhaps the most of anybody – I know this is true because as proof I have a baby-poop yellow mousepad that I was awarded at our 1995 20th reunion just for that distinction. Remember when they let us march them on the terrazzo by the new dorm? It was like a party over there, far from the eyes of those in the wing CQ shack. Guys in the quad below throwing footballs over our head, playing stereos for us. That was too good to last. Marching them on the Vandenberg ramp was definitely punishment, like being in the Gulag. I chose tours vs. confinements because at least then you could still go into town at night – and thereby earn MORE tours. Not a centurion, but I had to serve tours in our junior year for "conduct unbecoming a cadet” – a culmination of events that included a hot date, a rigged haircut inspection, and my middle finger at the noon meal. I never walked a tour, and I never served a confinement – until near the end of Firstie year, when my roommate Chuck Hippler and I received “12 and 8” for our graduation photo haircuts. Hoyt "me-no-more" Vandenberg (do you remember the sentiment that we should petition the Academy to remove "Vandenberg" from the name of the old dorm?) apparently reviewed all of the graduation photographs, and determined that our hair was not within limits. As I recall, before the photo, we had to have our Flight Commander, Squadron Commander,AOC, and a cadet Group Commander check our hair. Despite passing all of these inspections, we were nailed. And, the funny part is, I was not made to re-take the photo. Chuck and I served our confinements until midnight on Friday, at which time we stayed up all night watching T.V. so that we could sleep all day. Also, we damned up the shower so that it would fill with water and we could "swim," because you were allowed to take a shower during confinements. I don't know if we were part of the reason for it, but I heard that they later made it a requirement that you had to be sitting at your desk while serving a confinement. After I had finished my last tour, from my 2nd CDB – as the group marched by the mailroom before being dismissed, the back row of seniors peeled off to check mail. We got caught, but were let go after a warning. Except me. Because I was on Conduct Probation, I was written up and served cons. Unlike Bouf, I was nickel-and-dimed to death as a firstie; all but a few (8-12) of the cons were served firstie year. Our AOC had the policy that whenever someone in your flight received demerits for hair or room, the flight commander got the same number of demerits. So, you could easily go over your monthly max – so I had a lot of cons for the Winter when I was a flight commander (after you hit your max, 1 demerit = 1 con). Got “12 and 8” for a bad senior photo (remember, they were all inspected to be sure that we were in regs for hair and uniform)? Anyway, Tom Provost and I had to pick them up ‘cause the sergeant who inspected them saw we had glare on our glasses and needed a re-shoot – so we got “12 and 8” for that. In fact, most of us seniors picked up “12 and 8” for the photos; John Jensen took us all to the barber shop the following Monday before the re-shoots (CS-11 was on the 3rd floor then, right by the C-Store and barbershop) so he could watch the haircuts. Got “12 and 8” another time for not "moving in a military manner" (whatever that means) going to Mitchell Hall when I was in a sling with a broken collarbone. Got another “12 and 8” for allegedly letting my elbows touch the table during lunch of the last day of class before Christmas break; the explanation given was that I had not pushed my plate back from me far enough so that it was apparent that I was no longer eating. Got another “12 and 8” for not saluting during retreat, even though I was in a sling with a broken collarbone, the rationale being that I should have heard the bugle call before retreat and moved faster to get inside so that I would not have so salute; even though I was medically excused. Still another “12 and 8” for not having white parade trousers for the Awards & Decs parade – best part of that one was that they were approved indoors, it was just outside that "they" decided that the trousers were not white enough. Managed to serve those off just in time to graduate with the class. Like I said, nickel-and-dimed. Unlike Craig Dennington, whom I recall got “6 and 120” for being out after taps or something, and he was about 2 months into those when he picked up two more Class-1 CDBs, which would have added another 240 tours to his total. So, he bailed before Christmas (maybe before Thanksgiving). And then there’s Bouf – but his are so good that he has to tell those stories himself. The only tours/confinements I received as a cadet my were “12 and 8” for a crooked tie on my officer photo (a tie that the photographer adjusted I might add). Of course, I didn't want to tell anyone how I served one of those confinements. I was coaching/helping Pogo (Hugo Posey) prepare for the Wing Open tournament, so I planned to be in his corner during the match. The confinements got in the way; but I was undeterred. I marked my card "other" (remember the “authorized / other” card on our doors) and went down to cheer on Pogo from his corner when he won his weight class. I suspect not many others have been in the Champion's corner (Pogo's corner) during a Wing Open boxing match while serving a confinement. And fortunately, no one figured out what I was doing. CS-25 was restricted to the Cadet Area more than I care to remember during our senior year! For whatever! "They" picked off Charlie Sargent and Phil Martin! Agree with Magee that CS-25 had the most restrictions as firsties.